In 1883 Karl Otto Büttner, a mechanical engineer from Dresden, Germany, patented (together with Carl Gustav Th. Heyde) his first calculating machine (German patent №DE26640). The dimensions of the machine are: 37 x 10 x 21 cm, weight is 5,4 kg. 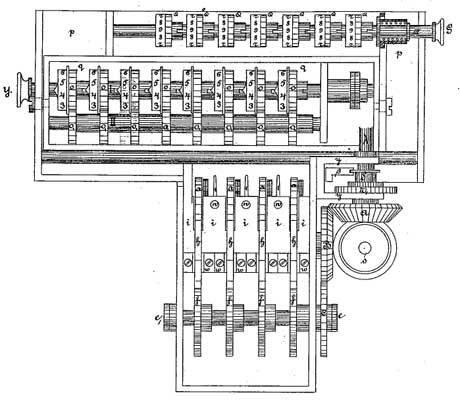 The appearance of the machine is very similar to the machine of Colmar, but its calculating mechanism is based not on the stepped-drum mechanism of Leibniz, but on relatively new type of mechanism—so called Schaltklinke (this mechanism was described first time by Leupold, and later on used by Braun and Dietzschold). This type of mechanism will be referred later on as Hamann mechanism, because it will be used in the machines of the famous German constructor Christel Hamann. This mechanism is called also switching latch, intermittent contact, adjustable pawl and selectable ratchet. What is the basic principle of the mechanism? The switching latch mechanism consists of a cylindrical cam surface that is adjustable, with a variable portion of the surface at a reduced radius. A pawl acts as a cam follower, engaging and turning an annular gear when it falls into the portion of the cylindrical cam with the smaller radius. The numbers are entered in the setting mechanism using sliding knobs which move toothed segments below. The position of the slide determines the action of the pawl and the subsequent movement of a cog-wheel. Using further intermediate cogwheels, the entered number is transferred into the result mechanism. A type of con-rod gadget enables an impulse-free operation. Changing from addition to subtraction or from multiplication to division is performed with a lever. This is accompanied by a shift in the position of the result mechanism. 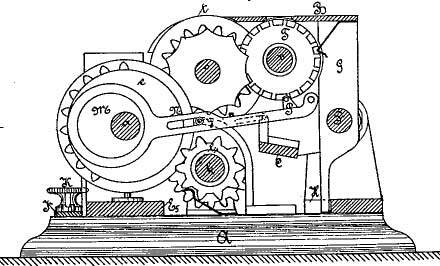 In 1888 Büttner received a second patent (together with Wilhelm Brückner), this time for completely different calculating machine, based on the classical pin-wheel mechanism (patent №DE47243). The machine (basic dimensions: 58,8 x 10,5 x 12,7 cm, weight: 8,2 kg) was manufactured and sold by Brückner in three kinds for 325 M, 425 M and 625 M. However, it was too big, which combined with its far too complicated construction, probably accounts for their business failure. In 1889 Büttner placed at a disposal of the Royal Saxon Statistical Bureau in Dresden a copy of his machine for everyday use. The machine proved to be very reliable and convenient for use. It was cheaper and simpler than other machines. In the following years Büttner tried to produce his machine in larger quantities in Dresden, but without commercial success. The machine was produced in three variants—with 12, 16 and 20 digital positions in the result mechanism and accordingly 7, 9 and 11 digital positions in counter of revolutions. The carriage is sloped forward for easier reading. The handle can be rotated in both directions. Zeroing of the two calculating mechanisms can be done by means of special keys. Entering of the numbers can be done by rotating of the input gear-wheels, and digits can be seen in windows, arranged in a row, which is very convenient.